A 5.3mm (0.2in) thick 4G phone has been announced by Japan’s biggest telecoms firm NTT Docomo. The compact device, which will be released in Japan next month, is designed to fit inside a card holder. It is part of a trend to offer so-called companion mobile devices to those who already own larger smartphones. The phone weighs 47g (1.6oz) and features an electronic-paper touchscreen, similar to e-books. It will have limited functionality, with calls, texts and a net connection but no camera or facility to work with mobile apps. 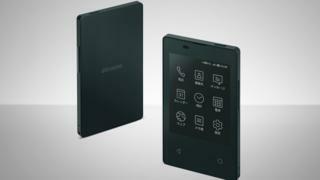 The phone – dubbed Card Keitai KY-01L – will be made by electronics firm Kyocera. The “simple, easy-to-carry” card phone is seen by NTT Docomo as a useful extra device for people who have already purchased large-screen smartphones. NTT Docomo describes the mobile as the “world’s thinnest” but that claim is likely to be disputed by other phone makers. The Oppo R5 was 4.85mm thick when it was released in 2014, followed the same year by the Vivo X5 Max at 4.75mm. And in 2016, Motorola released the Moto Z which was just under 5.2mm thick. The KY-01L will cost 32,000 yen ($280, £216). Ben Wood, chief analyst at research firm CCS Insight, said: “This flurry of so-called companion phones reflects the desire of phone makers to try and find new sales opportunities in a saturated market. This week, a tiny Android smartphone designed to be a companion device was launched in the US.